From the Old Town Square, take Karlova street, direction Charles Bridge (Karluv most). Follow the route round for a few minutes, then take the third road on the left, Liliova street. O'Che's is 50 metres along on the left-hand side. O’Che's Bar in Prague is a popular long-established pub in the Old Town, between Charles Bridge and the Old Town Square. The bar is interestingly themed as Cuban-Irish, not sure why!, but this broad sweep ensures its appeal to a range of people. Some come for the extensive sports coverage, others for cocktails and beers as they work their way around town. The selection of drinks on tap includes the Czech beer Gambrinus, plus international brands Guinness, Heineken and Magner's cider. Also, look out for the cocktail of the week for a bargain price. O’Che's Bar serves over 75 spirits, including the infamous Absinth - with an alcohol content of 75%, you may think you’re hallucinating when you see the décor is a combination of Che Guevara and Guinness! Live sports are shown on a large projection screen, with one of the clearest pictures of any Prague sports bar. And the range of channels O’Che's can pick up is extensive - they are hooked up to 5 satellite systems. Channels on offer include Sky Sports, BT Sport, ESPN, Setanta Sports, BBC and ITV. But with the wonders of the digital age, pretty much any sport and channel can be accessed. Just ask at the bar. 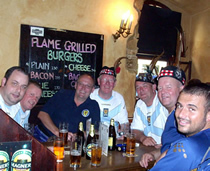 O’Che's attracts couples, expats, groups of friends, stag parties, hen nights, pretty much one and all. It's a good place to enjoy beers as you catch your favourite sports. And it's a good old fashioned friendly pub, for those who just wish to sit down and have a chat over a few drinks.